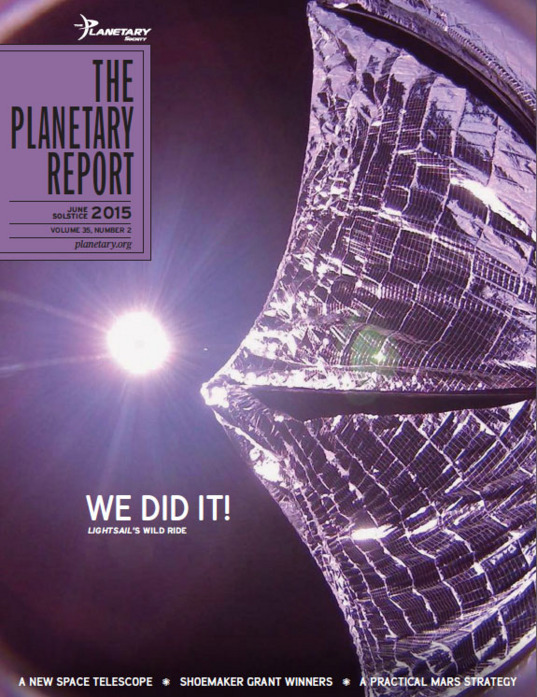 2 A Perfect Launch...: Doug Stetson reports on LightSail's dramatic test flight. 6 Pushing Back the Frontier: Jason Davis recounts The Planetary Society's history of advocating for a Pluto mission. 13 A Wider View: Jason Rhodes describes WFIRST, the new space telescope on NASA's drawing board. 17 Crowdfunding Success: Richard Chute reports on our wildly successful Kickstarter campaign. 20 Protecting Our World: Bruce Betts introduces the new NEO Shoemaker Grant winners. 22 Humans to Mars: Casey Dreier reports on a Star Wars solution for rogue asteroids. 4 Your Place in Space Bill Nye celebrates a season of success. 12 Factinos Bright spots on Ceres. 18 Volunteer Spotlight Kate Howells highlights our volunteers in Mexico City. <>19 Happening on Planetary Radio Mat Kaplan talks to the people who make space exploration happen. 21 What’s Up? The Perseids, Venus, Jupiter, and Mars!